Iceland, thrown into deep economic crisis by the worldwide credit crunch, has to expect charges that it has been imprudent and even profligate. But does the tiny North Atlantic country belong on a list of terrorist entities? The government, along with its population of 300,000, emphatically thinks not, and now a spirited national counteroffensive has been launched against the British government, which invoked a 2001 antiterrorism act to freeze an Icelandic bank's assets in Britain. 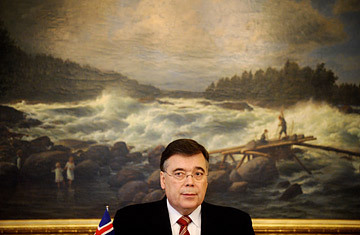 "We're still on the list  in the wonderful company of al-Qaeda, the Taliban, Sudan, North Korea, Iran and a number of other entities  where we do not belong," Iceland's Prime Minister, Geir Haarde, said in an interview with TIME, referring to the British government's website listing of regimes subject to financial sanctions. "The application of the antiterrorist legislation has created a lot of ill will here," said Haarde  particularly in combination with London's demand that the Icelandic government recompense British depositors in a subsidiary of the failed Icelandic bank Landsbanki to the tune of $5 billion, or "roughly half of Iceland's GDP," Haarde added. "Our parliament will never agree to accepting that kind of debt burden. It's unsustainable." The Prime Minister said that his government had engaged a team of lawyers in London and was looking at possible legal action against the use of the antiterrorist act. "It seems to me," said Haarde, "when you're not a terrorist country, not a rogue state, there might be a case to be made against applying such laws." Haarde said he would be willing to settle the dispute through some sort of international arbitration. Many Icelanders aren't waiting to voice their exasperation. Magnús Árni Skúlason, an economist with the consultancy Reykjavik Economics, helped organize an online petition protesting British Prime Minister Gordon Brown and the invocation of the antiterrorist legislation. Since its launch on Oct. 20, InDefence.is has gathered nearly 75,000 signatures as well as about 400 "postcards," primarily images of Icelanders with messages directed toward Brown. (A typical line: "We are not terrorists!") Skúlason said the group has also initiated talks in Reykjavik with British human-rights lawyers. "They are interested in this because they think the U.K. government is misusing legislation against a friendly nation. Where does it stop?" he added. That is a question Icelanders are now posing more generally, and with growing despair. Last month the country's banking system toppled entirely, forcing the government to nationalize the three biggest banks. Iceland's currency, the krona, sustained a 44% drop against the dollar over the past 12 months. The country's economy is hemorrhaging: every week brings new announcements of massive layoffs, there is a severe scarcity of foreign currency, and businesses are failing across multiple sectors. Haarde told TIME that gross debt was now over 100% of GDP. With their country in dire need of help, many Icelanders see Britain's draconian approach as not merely unfriendly but also damaging. Some Icelandic economists say the terrorist appellation provided the extra push that sent Iceland's already reeling financial system over the ledge into complete failure. For a country largely dependant on import and export with trading partners overseas, said Skúlason, that label has meant "Icelandic businesses are unable to maintain daily operations  like selling fish and transacting currency to and from Iceland. Foreign companies are reluctant to do business with Icelandic companies." He said ad agency Saatchi & Saatchi pulled its plans to film a commercial in Iceland last week with local production company Truenorth "because [its] insurance company didn't want to insure equipment and people in Iceland because they were on this list." That treatment from fellow NATO member Britain, Iceland's biggest trading partner, has left the country scrambling to find help elsewhere. Scandinavian countries are promising assistance but so far haven't put up any hard cash, pending approval this week of a $2 billion loan from the IMF. Haarde said that none of the IMF loan will go toward paying off external debt, including Britain's claims. And, so far, extravagant promises of a $5.2 billion loan from Moscow haven't materialized, although negotiations are continuing. Indeed, the only support to arrive thus far has been a loan from the tiny Faroe Islands for $52 million. Nowhere are the real effects of this dispute more evident than in the predicament of Icelanders living in the U.K. Edda Einarsdóttir, a 25-year-old Icelandic student in Glasgow, has already run into financial problems; her student loan is now substantially devalued, and she can't transfer money from Iceland into her British account. She'll try to get a job, but she has reservations. "I took the word Icelandic out of my résumé," she said. "I just don't know if anyone here would trust an Icelander anymore." See pictures of the world's eight new wonders, including Iceland's Surtsey Island. See pictures of the Arctic.